Each week or so I post things of which I'm fond. You can choose what happens after my recommendation. Ignore, embrace, debate. Earlier volumes of The Rabbit Recommends can be found here. I absolutely love to read. Books, magazines, Mindy Kaling's Twitter feed. The more words the merrier. 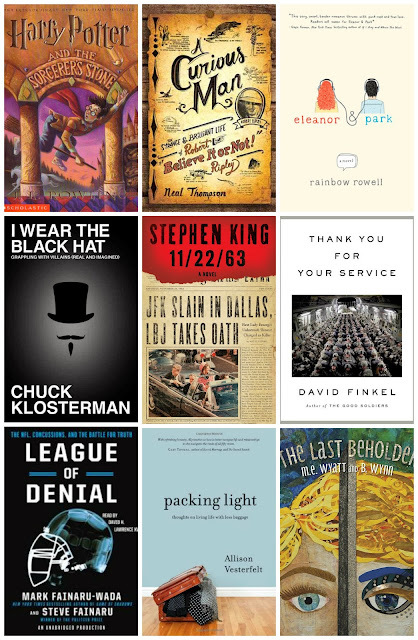 Here are nine books I read this year that stayed with me - always a sign of good pages. A few weren't actually published this year but sometimes I get behind in reading. And laundry. 1. Harry Potter and The Sorcerer's Stone: This came out almost 15 years ago and I somehow missed the boat. My friend Erin Moon gave this to me and insisted our friendship was riding on it. Once I finished it, I immediately wanted to start over. FYI: It's about a wizard and crazy wonderful stuff happens. 2. A Curious Man: The Strange and Brilliant Life of Robert "Believe It or Not!" Ripley: A shy cartoonist who became a world famous millionaire by pointing out and honoring the oddest people and things. This biography was absolutely fascinating. 3. Eleanor & Park: At first, I didn't think I could trust an author named "Rainbow Rowell." But who better to write a young adult romance set in 1986? Although it's written about teens, it will pull the most crotchety adult back to the whimsy of first love, while tackling tough issues such as bullying and family violence. 4. I Wear The Black Hat: I first discovered author Chuck Klosterman on ESPN's You Don't Know Bo 30 by 30 film. I don't know what it was about his commentary but I fancied him. When this book crossed my path, I was all in. It's a look at the pop culture and real-life villains who fascinate us and perplex us. And it's ridiculously funny. 5. 11/22/63: At 880 pages, this is not for the weak of arm or those who like to see the Kindle percentage escalate quickly. But Stephen King keeps you enthralled as you follow a time traveler as he prevents JFK's assassination. No horror, just good old-fashioned suspense. 6. Thank You For Your Service: There's a reason this is on almost every "Best of 2013" list (Amazon, NPR, Publisher's Weekly, NYT.) Pulitzer prize winning journalist David Finkel embedded with the 2-16 Infantry Battalion in Baghdad and wrote the subsequent For The Good Soliders. This book is after those same soldiers returned home. It's mesmerizing. 7. League of Denial: The NFL, Concussions, and the Battle for Truth: I'm a huge college football fan, but I don't even watch pro ball. But leave it to Frontline and Jon Stewart to convince me to pick up this book. It's investigative journalism at its finest because I was hooked on every page. 8. Packing Light: Thoughts On Living Life With Less Baggage: I picked up this book since I had met author and blogger Allison Vesterfelt IRL. As a result, I cancelled my order for a new iPhone and started evaluating the "wants" versus the "needs" in my life. It was the worst. A travel memoir that will call you to a place of crisis. In the best way. 9. The Last Beholder: I actually re-read this in 2013 and was transported again to the magical fantasy world of Wallis and Gus. It's a character-driven imaginative wonder. Anne at Modern Mrs. Darcy, who once bought me a gift card when I was hit by a naked drunk driver, is hosting a link up of best reads in 2013. If you need a slew of recommendations, go there to see what the rest of the Internet suggests you read. What was the best book, magazine or twitter feed you read this past year? Note: The book links in this post are affiliate links. Your clicks might lead me to being able to pay my water bill. No pressure.